3DFILM & MUSIC FEST will be the first film and music festival of its kind in Spain and one of the first worldwide, that exclusively uses digital S-3D technology. It will be an independent audiovisual and cultural event that will bring up-and-coming and well-established creative people together. 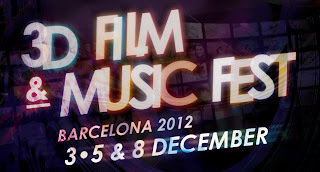 Filmmakers, audiovisual professionals, composers, musicians, performing artists, researchers, institutions, universities, etc. will all make up the foundation of the future of this new technology. The opening of the Festival will take place on ‘3D Day’ each year (3rd of December). We expect this day to become the International Day of the 3D industry. On this significant date for the inauguration of 3DFILM & MUSIC FEST, we will hold the GALA AWARDS FOR EXCELLENCE IN 3D. This award ceremony will be the recognition of the work of those institutions, companies and individuals who have given a boost to the development of this technology nationally and internationally. We’re aiming to make Barcelona the benchmark for quality in the development and promotion of 3D technology.